We continue to provide advice about online marketing budgets in a variety of industries, and over the last two years we have been partnering with more manufacturing companies to help them generate leads and sales. Based on industry-provided research and our own experience, we’ve identified a realistic marketing budget calculation for manufacturing companies who are ready to more fully leverage the internet to generate more business. U.S. manufacturing companies have had their ups and downs the last ten years, and many were comfortable using traditional marketing methods, specifically trade shows and print media. Their sales teams followed suit, traveling in their assigned territories to meet with prospects and customers, and following up by phone or email. We have noticed a shift in thinking the past two years as we speak to more manufacturers. Those traditional B2B lead generation processes are less effective, more costly and time consuming, and the sales teams are complaining that their companies look awful online. They have limited electronic media to share, and their website (if they have one) is outdated and generates zero leads. Given this recent awakening, manufacturers are wondering how much should be budgeted for marketing. And, which marketing channels are most appropriate for marketing a manufacturing company? If you’re currently evaluating your marketing budget for 2018, first take a look at 2017's budget and results. Based on your marketing performance, determine what areas performed well, and cut the areas that did not deliver the results you expected. 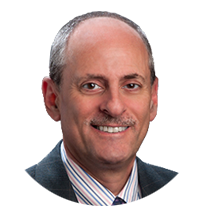 Talk to both your sales and marketing teams to get input. Should your 2018 Manufacturing Marketing Budget be Higher, Lower or Different than 2017? Evaluating what other manufacturing companies are doing can be helpful, though there may be variations from one company to another when considering the size, location, competition, goals, customer mix, and machines or equipment offered. The majority of our manufacturing clients spend between $3,000/month and $5,000/month on digital marketing. This includes marketing services - strategy, fresh website content and blog updates, case studies, running Google and/or Facebook or LinkedIn ad campaigns, analytics reporting and analysis, and email marketing. It also includes money for digital advertising - paying Google, Facebook or LinkedIn for clicks on digital ads. Some companies may need to replace their prehistoric websites first prior to starting any digital marketing efforts. We continue to see a shift in where marketing dollars are being spent. 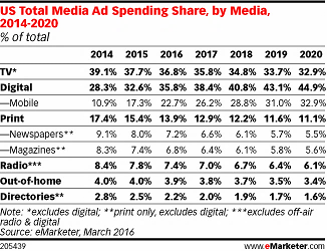 This chart from eMarketer highlights how spending has shifted away from more traditional ad platforms (TV, radio, print) to various digital marketing activities. eMarketer projects digital ad spend will be at least 40% of overall marketing spend in 2018, with that number rising to 45% in 2020. Similar to many industries, manufacturing companies are starting to shift money from traditional marketing channels to digital channels, but exactly how much is unclear. There is limited independent data available which addresses manufacturing company marketing trends. However, there is data available across industries that we utilize to estimate and appropriate the level of marketing spend as it relates to a firm's revenue. 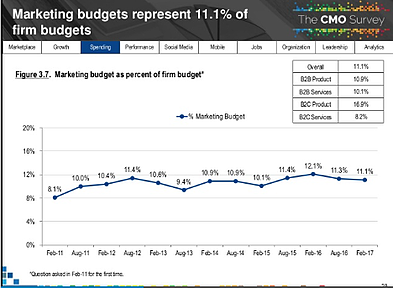 "The CMO Survey" shows that on average, B2B firms spend 11% of their expense budget on Marketing. This can include internal marketing staff, traditional and digital marketing activities. Across industries, there is a wide variation in marketing spend. 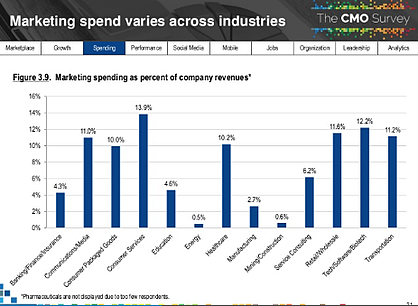 Here's another chart from "The CMO Survey" that compares industry spend as a percent of revenue. Manufacturers spend about 2.7% of their revenue on marketing. If you also sell your products online, you would most likely spend more, potentially up to 10% of your revenue. Which Digital Marketing Activities Are Most Effective? This is a pretty typical question we receive, and the answer is "Well, it depends". 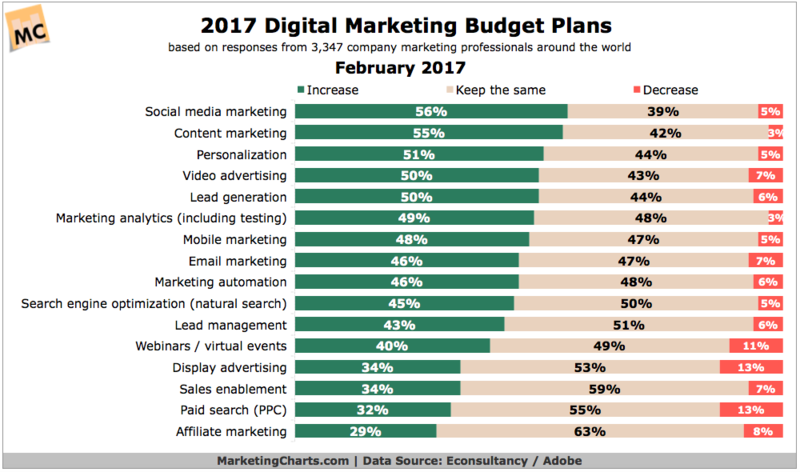 Here's a chart highlighting digital marketing budget spending plans by type. As you can see, amounts are being shifted to social media marketing, content marketing, personalization, video, lead generation, analytics and mobile marketing. However, the ever-popular forms of digital marketing- Paid Search (PPC), Display Ads, and email marketing, are still used widely and generate results. 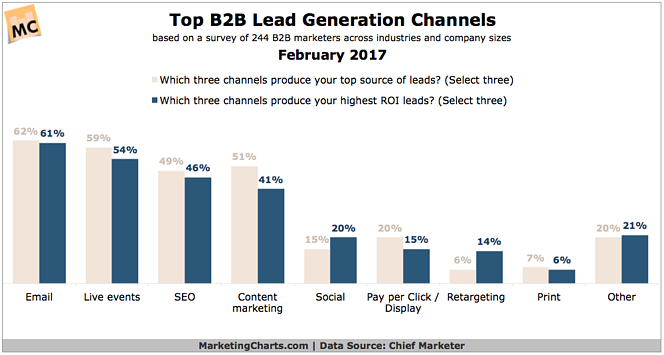 Below is a survey from Chief Marketer on the top B2B marketing tools used to generate leads. For our manufacturing clients, SEO, Content Marketing, and Google pay-per-click ads generate the most website traffic and leads early on. If you haven't taken a look at your website analytics, marketing, and lead generation results, now is a great time to start. Check out our tips on developing robust dashboard reporting. You can also start focusing more heavily on identifying your target market—just one or two at a time, and invest in developing buyer personas so your marketing spend can attract the right buyers who need your equipment and products. We have seen a digital marketing awakening with manufacturers. They are starting to become proactive in adopting a more online oriented marketing approach. Check our your competition - I bet they are improving their online presence and thinking their website should generate more leads.